As your visa consultant might already have told you, IELTS is an essential examination which you have to appear in order to be able to study, migrate or work in some foreign countries. Earlier the format of IELTS exam used to be only paper based, but now it can be taken on a computer as well. The new computer-delivered format of IELTS exam has provided many advantages to the candidates. Instead of using paper and a pencil to complete the test, the exam can now be done on a computer. But it is essential to be familiar with the system before you appear for the exam so that you can concentrate on the content of the test instead of trying to understand the system during the test. The computer and paper-based formats of the test have the same sections that are listening, reading, writing, and speaking section. The first three sections you can do on a computer instead of writing on a paper. The speaking part is carried out face-to-face with an IELTS examiner. The timing for the computerized test is the same as the paper-based test, and the test automatically gets finished upon completion of time. To prepare for the writing section of a computerized test and improve your typing, you can practice by writing on your home computer. Make sure that you turn off the grammar correction tools while practicing as it will not be available during the actual test. You can also check out various mock tests available online or get it from institutes providing IELTS coaching in Ahmedabad to get more familiar with the test structure. Many candidates are often worried that their handwriting might negatively affect their result and create a wrong impression. Appearing for a computerized test eliminates that concern. Moreover, typing on a computer is much easier and faster as compared to writing with a pen or pencil. 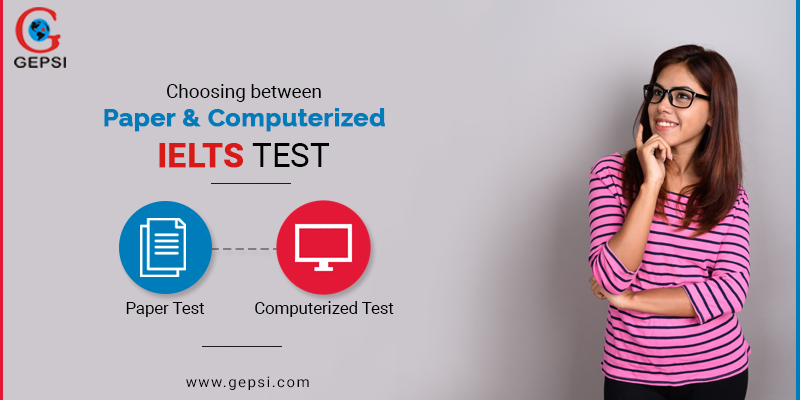 The results for computerized IELTS test are available much sooner than written tests. It usually takes two weeks for a written test score to appear while the computerized one is available in even less than a week’s time. Having the option to choose between the two types of test is a good thing for the students. Though candidates are much familiar with computers these days, some are more comfortable with giving the test on a paper in their writing.